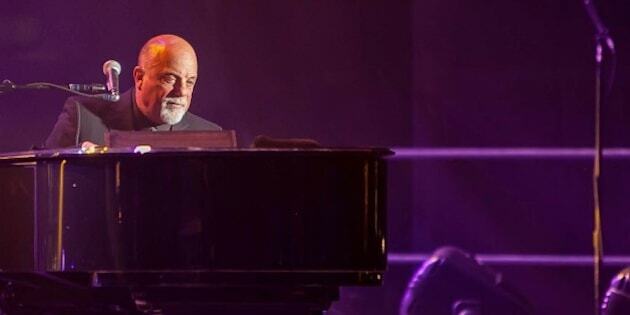 Billy Joel was nearly halfway through his premiere gig in Quebec City for Festival D'ete Friday night when he energized the capacity crowd on the Plains of Abraham with a huge hit song. Okay, so it wasn't his hit song. And it wasn't Joel but his roadie Chainsaw who stomped around belting out AC/DC's "Highway To Hell" as Joel played guitar. Yet after that humorous but effective jolt the audience and Joel came to life. The singer, often looking like his mind was working triple time while performing his cache of favorites, opened with "My Life" and "Pressure." He also realized it was his first concert in the city after all this time. "I've never been here," he said. "Fifty fricking years I've been doing this job!" However songs like "This Is The Time" and the jazzy "Zanzibar" might have had diehard fans drooling but not the masses. Joel, dressed in a black suit and occasionally twirling a fly swatter between tickling the ivories, saw the crowd take note during "New York State Of Mind." After the brief homage to Bon Scott and Angus Young, which saw Chainsaw also use a fire extinguisher, Joel began a steady stream of popular radio staples such as the cuddle-inducing "She's Always A Woman" and especially with "Piano Man," the latter resulting in a sea of cellphone and camera lights overhead and Joel drowned out by the collective's voice. The other homestretch highlights included "River Of Dreams" which veered into The Beatles' "A Hard Day's Night" which the crowd belted out. Looking as if he would call it a night 90 minutes in, Joel returned for a healthy encore unfortunately starting with "We Didn't Start The Fire." Thankfully "Uptown Girl" and early gems "It's Still Rock And Roll To Me" and "You May Be Right" removed any doubt Joel's repertoire has few rivals. Almost as bizarre as Joel making his first stop here was the fact his opener was Blondie. "Billy Joel's coming up! Billy Joel's up next!" singer Debbie Harry said to close, perhaps the first and last time she'll ever utter such remarks. Harry – who sported a dress featuring a homily face on the front and "Blondie 4 Ever" on the back – ensured the "hill people" would get their money's worth. The warm, breezy "The Tide Is High," "One Way Or Another" and "Call Me" had Harry working the audience while drummer Clem Burke showed he didn't lose any steam playing behind a wall of plexiglass. Aside from a few clunkers such as "Euphoria” and "Sugar On The Side," Blondie demonstrated why they are the forefathers of dance-rock with “Rapture” and “Heart Of Glass. Both songs featured odd snippets of covers with the Beastie Boys' "(You Gotta) Fight For Your Right (To Party!)" in "Rapture" while Deee-Lite's "Groove Is In The Heart" found its way into "Heart Of Glass."